We have come to Bristol for the weekend to see some friends. Bristol is a very cool city. 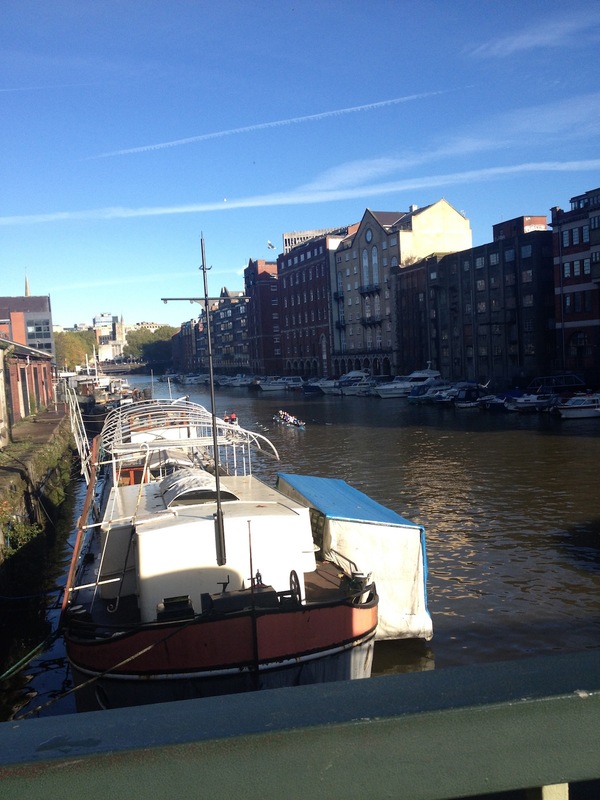 Where Edinburgh is perhaps a little too perfect, Bristol is a little rough around the edges in an endearing sort of way. A bit like Glasgow. 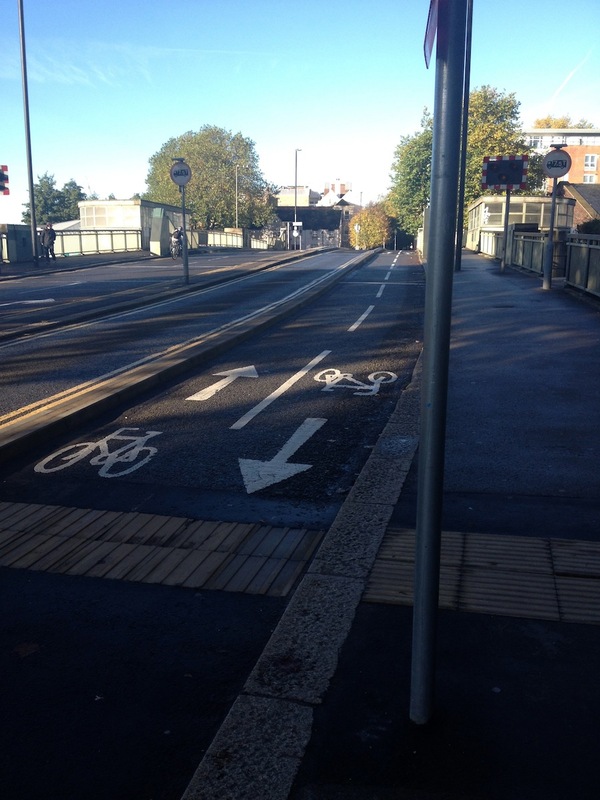 There’s some good cycling infrastructure here too. 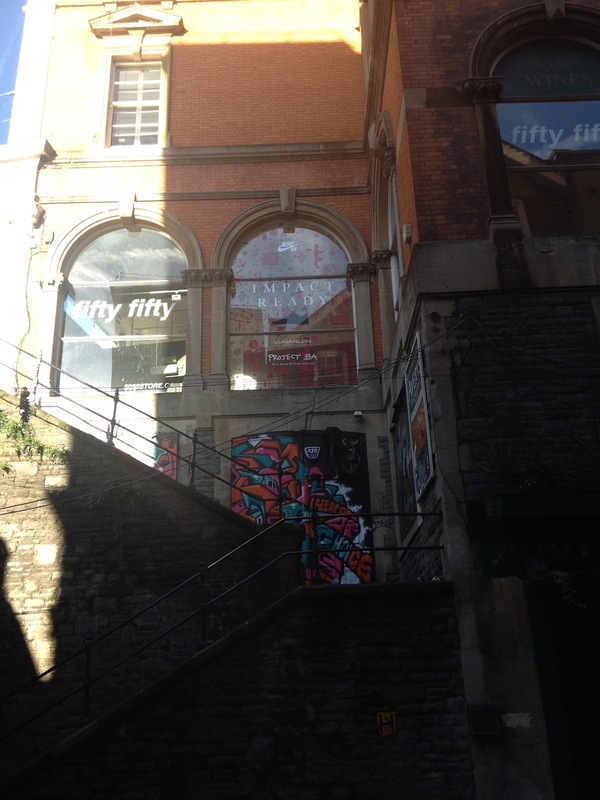 Bristol is famous for its graffiti. The famous street artist, Banksy, was born here and you can take a self-guided tour to see some of his work. He’s a year older than I am and to save you the trouble of looking it up I’m 38. He is currently residing in New York and appears to be having lots of fun there. His art does not only include graffiti but also things like this truck he recently sent touring through the meat-packing district of New York. 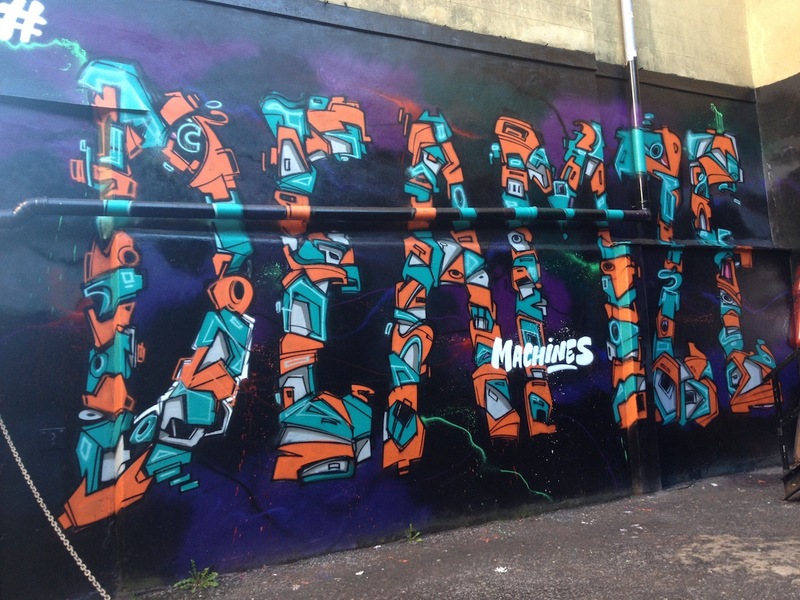 I only saw a couple of his pieces here in Bristol because we are short on time and had a very important four-year-old birthday party to attend. 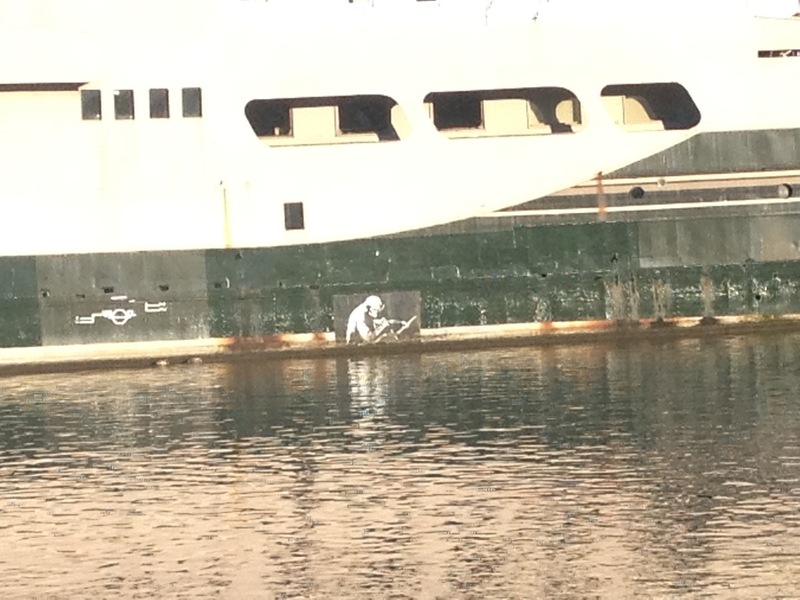 Here’s one on the side of a nightclub boat, the Thekla. 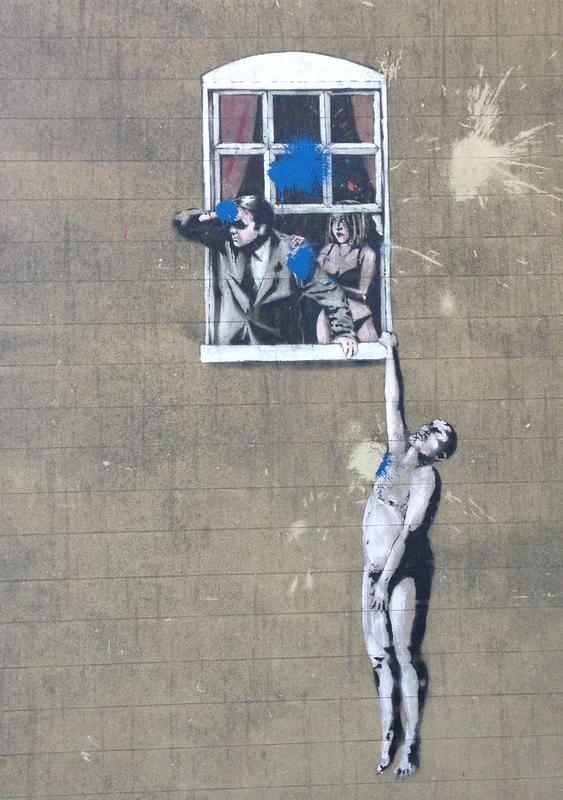 This one of the secret lover hanging naked from the window ledge is one of his most famous and my favourite. The blue spots of paint on it are not supposed to be there. It has been vandalised. This happens fairly often to Banksy’s works and every now and then they cleaned up and restored. Sometimes they get encased in perspex to protect them. 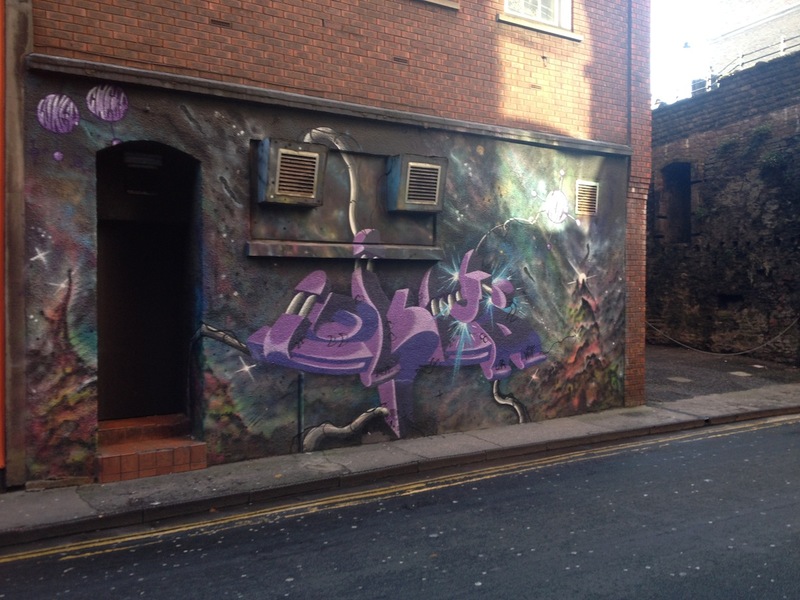 The following pics are from other graffiti artists in the city. I thought Newtown Graffiti might be interested to see them. Posted in Photos, Travel and tagged Banksy, Bristol, cycling infrastructure, graffiti, photos, street art, travel, traveling. Bookmark the permalink. Sorry, Bob. We’re just trying to make the most of our time here. When we return to Auckland the traveling will stop, sadly, :-(. I know you are Rachel, I would as well if I had the opportunity, sorry to hear your traveling will stop, yet I think you will find a way to go somewhere. I am very hopeful, Bob. The thought of spending the rest of my life in Auckland is very depressing and not one I entertain at all. I would rather not live at all than live there. Bristol is a great city. Lucky you to live there! What was the sheep thing? I used to have a friend in Bristol. It is very pretty and has some lovely areas, but as you say some rougher parts too! Keep up the travelogues, Rachel. Always enjoy them. By the way, was the party for Elizabeth’s great buddy? If so, how was the reunion? Thanks, Graham. This will all be but a distant memory in a year’s time. 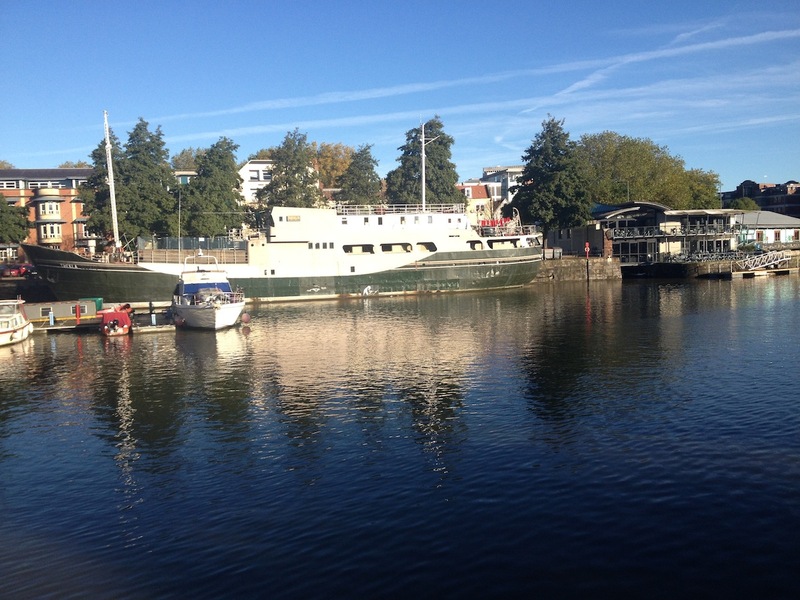 Did your friend like living in Bristol? I think it is a place I could quite happily live but it’s always hard to know unless you try. Yes, it was the party for her best buddy. What a good memory you have! It has been almost a year since they’ve seen each other and it wasn’t clear that they actually recognised one another. They played and had a nice time together but I didn’t notice the same best buddy vibe that they used to have. I suspect they would need to see more of each other for that to develop again. I don’t go there often, my husband knows it very well however. As does my eldest son who has a group of friends who live there. My highlight was visiting the SS Great Britain with my son when he was 3 years old so that shows you how long ago that was! Although we have visited friends there and love the vibe. We prefer Brighton though for vibe. Bristol is a great place to visit but I don’t think I’d like to live there, but then, I haven’t really explored it properly, having never had the need. I’m not actually sure where you live, Sherri? Somewhere near Bristol I now know! I wasn’t expecting to like Bristol so much. It’s an interesting place. I know ‘interesting’ is a boring word but I can’t think how else to describe it. Perhaps it’s better to say that the city has character. Any city that has lots of bike paths gets an extra 10 points too. I never made it to the SS Great Britain. There just wasn’t time. I’m sure I’ll go back one day though. Yes, I loved all the graffiti too. Some of it was very clever.